POHOATA, S. , POPA, A. , ALEXANDRU, N. D.
The Gaussian pulses have been mostly used within communications, where some applications can be emphasized: mobile telephony (GSM), where GMSK signals are used, as well as the UWB communications, where short-period pulses based on Gaussian waveform are generated. Since the Gaussian function signifies a theoretical concept, which cannot be accomplished from the physical point of view, this should be expressed by using various functions, able to determine physical implementations. New techniques of generating the Gaussian pulse responses of good precision are approached, proposed and researched in this paper. The second and third order derivatives with regard to the Gaussian pulse response are accurately generated. The third order derivates is composed of four individual rectangular pulses of fixed amplitudes, being easily to be generated by standard techniques. In order to generate pulses able to satisfy the spectral mask requirements, an adequate filter is necessary to be applied. This paper emphasizes a comparative analysis based on the relative error and the energy spectra of the proposed pulses. J. R. Fernandes, D. Wentzloff, "Recent Advances in IR-UWB Transceivers: An Overview," Proc. of IEEE International Symposium on Circuits and Systems ISCAS 2010, Paris, 2010, pp. 3284-3287. G. Lu, P. Spasojevic, L. Greenstein, Antenna and Pulse Designs for Meeting UWB Spectrum Density Requirements," IEEE Conf. on Ultra Wideband Systems and Technologies, 2003, pp. 162-166. X. Luo, L. Yang, G. B. Giannakis, "Designing Optimal Pulse-Shapers for Ultra-Wideband Radios," Journal of Communications and Networks, Vol. 5, No. 4, 2003, pp. 344-353. 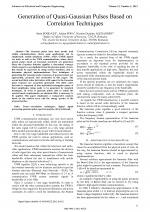 Federal Communications Commission, In the matter of revision of part 15 of the commission's rules regarding ultra-wideband transmission systems, FCC First Report and Order, 2002. M. C. Jeruchim, P. Balaban, K. S. Shanmugan, Simulation of Communication Systems, New York: Plenum Press, 2000. A. Jurado-Navas, J. M. Garido-Balsells, M. Castillo-Vasquez, A. Puerta-Notario, "Numerical model for the temporal broadening of optical pulses propagating through weak atmospheric turbulence," Optics Letters, 34 (23), 2009, pp. 3662-3664. J. Dimitrov, "A bell-shape pulse generator," IEEE Trans. on Instrumentation and Measurement, 39(4), 1990, pp. 667-670. X. Zhang, M. Elgamel, M. A. Bayoumi, "Gaussian pulse approximation using standard CMOS and its application for sub-GHz UWB impulse radio," International Journal of Circuit Theory and Applications, 38(4), 2010, pp. 383-407. N. D. Alexandru, C. Davideanu, V. Cehan, L. Scripcariu, L. Pancescu, "On a Class of Continuous Pulse Shapes", in Proc. 5th International Conference on Telecommunications ICT'98, Porto Carras, Greece, vol. I, 1998, pp. 208-212. J. Ryckaert, C. Desset, A. Fort, M. Badaroglu, "Ultra-wide-band transmitter for low-power wireless body area," IEEE Trans.on Circuits and Systems, vol.52, 2005, pp. 2525-2525. T. Phan, J. Lee, V. Krizhanovskii, S. Han, S. Lee, H. Oh. N. Kim, "4.7pJ/pulse 7th derivative Gaussian pulse generator for impulse radio UWB," in Proc. of IEEE International Symposium on Circuits and Systems ISCAS 2007, New Orleans, USA, 2007, pp. 3043-3046. H. Kim, Y. Joo, "Fifth-derivative Gaussian pulse generator for UWB system," IEEE RFIC Symposium Digest Papers, Long Beach, CA, 2005, pp. 671-674. 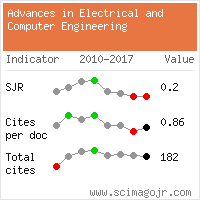 Citations for references updated on 2019-04-22 06:35 in 76 seconds. Website conception, design and maintenance by Eugen COCA. Content updated on 28 Feb 2019. Site engine updated on 28 Feb 2019. This page was generated on the server in 0.106 seconds and loaded in your browser in > seconds.